Mobile shopping revenue jumped 22% during the 2017 holiday season, compared to the same period in 2016, and was the only e-commerce channel with year-over-year growth, according to the Mobify’s 2017 Q4 Mobile Commerce Insights Report. The report stated that the biggest single spike in mobile revenue for retailers and brands occurred on Cyber Monday after 6 p.m., although the most mobile shopping traffic for a single day during the holiday season came on Black Friday as shoppers used their mobile devices both online and in-store for purchasing and research purposes. 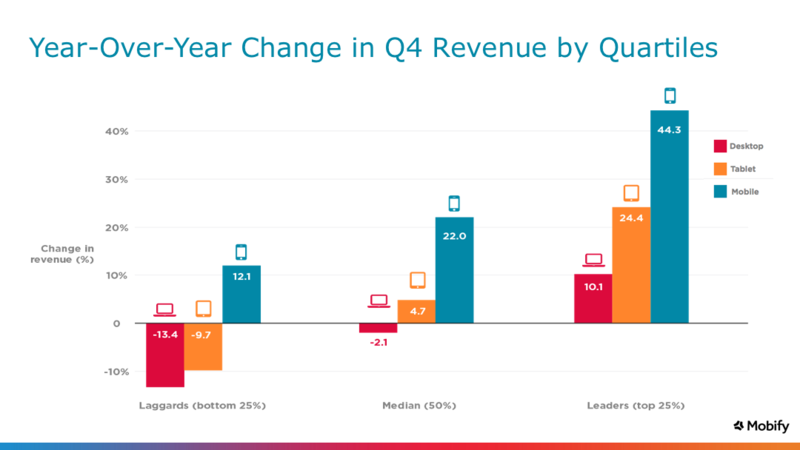 Mobify’s research also suggested retailers that have been most aggressive with mobile technology saw mobile revenue growth during the holiday period that was up to almost 50% higher than the same period last year, well above the sector-wide growth figure of 22%. The rise of mobile shopping may be on the verge of becoming old news. Mobify's numbers back up the growing understanding that consumers are shopping by mobile always and everywhere — not just on the go, but even while inside brick-and-mortar stores. Mobify isn’t the first party to note that the 2017 holiday shopping season was mobile shopping’s big moment. Among others, Adobe Systems recently stated that mobile shopping revenue for November and December grew 28% over 2016 to almost $36 billion and represented 33% of all online revenue during the holiday season. Meanwhile, a report in Diginomica noted Salesforce’s estimation that 41% of all online orders placed during Cyber Week came in via mobile devices, almost 30% more than for the same stretch in 2016. Also, the holiday numbers are really just an extension of all the mobile shopping activity that already was happening in 2017. App Annie said that usage of Android retail apps surged about 70% last year to 50 billion sessions. The tipping point may now be in the rearview mirror. One of the things that Mobify said about the recent holiday season's mobile shopping boom is that all retailers, regardless of their experience with mobile or the richness of their mobile shopping experience, seemed to benefit. The mobile leaders, as noted above, certainly took in the biggest windfall, but even the laggards enjoyed a nice boost. Note to the laggards: Don't look on that recent mobile shopping boost as a sign that you can do little or nothing and still win over mobile shoppers. As m-commerce becomes more synonymous with online shopping in general, shoppers will be looking for more from their mobile shopping experiences. Mobile site and app performance and depth of features are things that will matter, and more savvy mobile shoppers will figure out who offers the best experience. Maybe they already did.